Yup, as the name reflects, today we will go through the Dual Candlestick Patterns i.e. candlestick patterns, which are formed by a combination of two candlesticks, these dual candlestick patterns are an important tool to analyze the price action for any currency pair in the forex market because it gives us an edge by providing the price action information very quickly within two candlesticks rather than lagging. The term Dark Cloud refers to a Dark Bearish Candlestick over a White Bullish Candlestick. 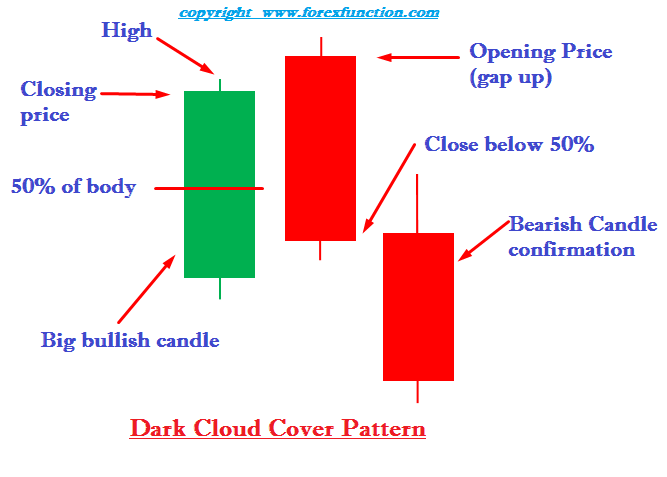 A dark cloud cover candlestick pattern is a bearish reversal pattern formed at the peak of a price swing. In a Bullish trend, when the price is advancing continuously and at the higher price level, if a bearish candlestick is formed and pierces deeply up to a minimum of 50% into the price levels of a previous strong bullish candlestick, as a result, we get a dark cloud cover candlestick pattern. A Dark Cloud Cover reflects the market information that the bulls have tried their best in pushing the prices higher, but due to some reason bears have reacted strongly, as a result, the bears have pierced deeply into the price levels of the previous strong bullish candlestick; such interpretation gives a clear vision that there is a loss of momentum in buying pressure, and the demand is now decreasing, further, bears have made the market closed at a lower price level and due to the loss of momentum in buying pressure, a potential reversal and/or market indecision might result the prices to move in an opposite or sideways direction. ✓	Currency pair is trending upwards. ✓	A set of two candlesticks are required; the first one is a strong bullish candlestick and the second one is a bearish candlestick having a high above the high of the prior bullish candlestick and closing a minimum of half way in to the bullish candlestick. ✓	The deeper it pierces into the immediate previous bullish candlestick, the more is the dark cloud cover candlestick pattern powerful. The Piercing candlestick pattern is the opposite of dark cloud cover candlestick pattern. 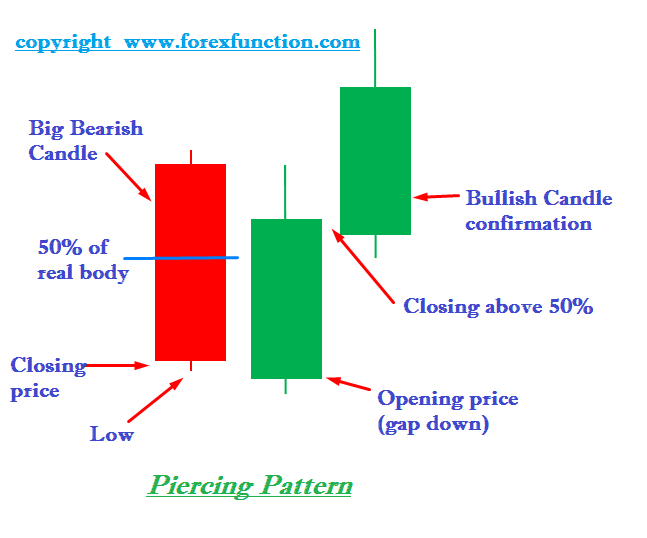 The term Piercing refers to a White Bullish Candlestick piercing into a Strong Black Bearish Candlestick. A piercing pattern is a bullish reversal pattern formed at the trough of a price swing. In a Bearish trend, when the price is declining continuously and at the lower price level, if a bullish candlestick is formed and pierces deeply up to a minimum of 50% into the price levels of a previous strong bearish candlestick, as a result, we get a piercing candlestick pattern. A Piercing candlestick pattern reflects the market information that the bears have tried their best in pulling the prices lower, but due to some reason bulls have reacted strongly, as a result, the bulls have pierced deeply into the price levels of the previous strong bearish candlestick; such interpretation gives a clear vision that there is a loss of momentum in selling pressure, and the demand is now increasing, further; bulls have made the market closed at a higher price level and due to the loss of momentum in selling pressure, a potential reversal and/or market indecision might result the prices to move in an opposite or sideways direction. ✓	Currency pair is trending downwards. ✓	A set of two candlesticks are required; the first one is a strong bearish candlestick and the second one is a bullish candlestick having a low below the low of the prior bearish candlestick and closing at a minimum of half way in to the bearish candlestick. ✓	The deeper it pierces into the immediate previous bearish candlestick, the more is the piercing candlestick pattern powerful. These are very powerful carnivore types of candlesticks; they not only pierce into the price levels of the previous candlesticks but completely swallow it i.e. engulfs it completely. There are two types of engulfing candlestick patterns; one is a Bullish Engulfing Pattern, and another is a Bearish Engulfing Pattern, both the patterns are quite similar to the Piercing Pattern and Dark Cloud Cover respectively, but the main difference between them is the response of the second candlestick towards the first candle i.e. in the dark cloud cover and piercing patterns, the second candlestick pierces into the price levels of the first candlestick, but in these engulfing patterns the second candlestick completely wraps the immediate previous candlestick i.e. both the high and low of the second candlestick are more than or equal to the prior candlestick. A Bullish Engulfing Pattern is a bottom reversal pattern. In a bearish trend, when the price is declining continuously and at the lower price level, if a strong and large bullish candlestick is formed immediately after the bearish candlestick and it is outweighing completely to the previous bearish candlestick, as a result, we get a bullish engulfing candlestick pattern. A Bullish Engulfing Candlestick Pattern reflects the market information that the bears have tried their best in pulling the prices lower, but due to some reason bulls have reacted very strongly, as a result, the bulls have completely outweighed the immediate previous bearish candlestick; such interpretation gives a clear vision that there is a loss of momentum in selling pressure, and now the demand is stronger, further; bulls have made the market closed at a higher price level and due to the loss of momentum in selling pressure, a potential reversal and/or market indecision might result the prices to move in an opposite or sideways direction. ✓	A set of two candlesticks are required; the first one is a small bearish candlestick and the second one is a strong and large bullish candlestick having a big real body in which it completely wraps the small real body of the bearish candlestick and has a high above the high of the prior bearish candlestick. ✓	The more is the second bullish candlestick bigger and stronger than the first bearish one; the more is the bullish engulfing candlestick pattern powerful. ✓	If the sizes of both the candlesticks are same then the pattern is weak and may result more into a sideways trend rather than trending upwards. A Bearish Engulfing Pattern is a top reversal pattern. In a bullish trend, when the price is advancing continuously and at the higher price level, if a strong and large bearish candlestick is formed immediately after the bullish candlestick and it is outweighing completely to the previous bullish candlestick, as a result, we get a bearish engulfing candlestick pattern. A Bearish Engulfing Candlestick Pattern reflects the market information that the bulls have tried their best in pushing the prices higher, but due to some reason bears have reacted very strongly, as a result, the bears have completely outweighed the immediate previous bullish candlestick; such interpretation gives a clear vision that there is a loss of momentum in buying pressure, and now there is a less demand, further; bears have made the market closed at a lower price level and due to the loss of momentum in buying pressure, a potential reversal and/or market indecision might result the prices to move in an opposite or sideways direction. ✓	A set of two candlesticks are required; the first one is a small bullish candlestick and the second one is a strong and large bearish candlestick having a big real body in which it completely wraps the small real body of the bullish candlestick and has a low below the low of the prior bullish candlestick. ✓	The more is the second bearish candlestick bigger and stronger than the first bullish one; the more is the bearish engulfing candlestick pattern powerful. ✓	If the sizes of both the candlesticks are same then the pattern is weak and may result more into a sideways trend rather than trending downwards. In the above EURUSD, 4 hour chart, a strong and large bullish candlestick completely outweighed the immediate previous bearish candlestick resulting into a bullish engulfing pattern. After the price was being appreciated beautifully for a couple of days, a strong and large bearish candlestick was formed immediately after a bullish candlestick at the highest price level of the price swing resulting into a bearish engulfing pattern. Harami is basically the opposite of engulfing pattern and is also known as a Harami Cross. In a Harami cross, the first candlestick is strong and large than the second candlestick, further the size of the real body of the second candlestick is very less and, for example, it is like a spinning top or a doji. There are two types of harami’s; the first one is a Bullish Harami and the second one is a Bearish Harami. A Bullish Harami is a bottom reversal pattern. In a bearish trend, when the price is declining continuously and at the lower price level, if a small real body bullish candlestick (like a spinning top or doji) is formed after a strong and large bearish candlestick, as a result, we get a bullish harami cross. ✓	A set of two candlesticks are required; the first one is a strong and large bearish candlestick and the second one is a small bullish candlestick like a spinning top or doji. ✓	The more deeply is the second bullish candlestick closing in to the price levels of the first strong and large bearish candlestick; the more is the bullish harami cross powerful. A Bearish Harami is a top reversal pattern. In a bullish trend, when the price is advancing continuously and at the higher price level, if a small real body bearish candlestick (like a spinning top or doji) is formed after a strong and large bullish candlestick, as a result, we get a bearish harami cross. ✓	A set of two candlesticks are required; the first one is a strong and large bullish candlestick and the second one is a small bearish candlestick like a spinning top or doji. ✓	The more deeply is the second bearish candlestick closing in to the price levels of the first strong and large bullish candlestick, the more is the bearish harami cross powerful. 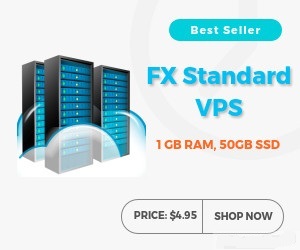 In the above GBPUSD, 1 hour chart, you will see the price advancing with strong bullish candlesticks, a bearish candlestick with small real body known as a spinning top was formed immediately after a strong bullish candlestick resulting into a formation of bearish harami cross and after that the price started declining without any resistance and after a couple of days, a bullish candlestick with small real body known as a spinning top was formed immediately after a strong bearish candlestick resulting into a formation of a bullish harami cross and after that the price started appreciating very beautifully resulting into a bullish trend. Kindly remember in the above illustrations, all candlestick patterns were eligible for trading because they were confirmed by an opposite direction trending candlestick before entering the trade, as a result, the trade was successful because price respected the engulfing patterns and harami crosses by moving in the appropriate direction. Now this does not mean that every time you see a dual candlestick pattern, you should trade it, because doing such a thing would be gambling, but in order to profit from a candlestick pattern, it is recommended to wait for the price confirmation in order to take calculated low risks for higher profits i.e. let the bulls and bears show their power by pushing or pulling the prices, as a result, by showing a price confirmation candlestick after every candlestick pattern and also remember, the price should not make a fresh high or low than the high or low of every respective candlestick pattern before opening a position, if it does, then the candlestick pattern is not powerful enough for leading the prices.